This fibre-free mascara is resistant to clumping or flaking throughout the day and is easy to build, leaving you in control of how you want your lashes to look. Includes an innovative, two-sided wand with one side having short, soft silicone teeth which reach the roots of the lashes and flood them with product first time. The other side has longer, comb-like teeth which separate and fan-out the lashes for a truly 'false eyelash' effect. Contains moisturising emollients that help care for the lashes. Starting at the root of the lashes, glide the wand through the lashes in a zig-zag motion and apply light pressure upwards. 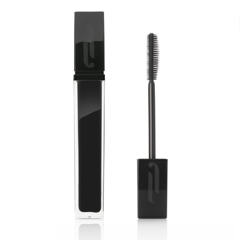 Give lashes a second and third coating with the larger side of the wand to create a greater volumising effect.